Rogaineis the leading hair loss product available and the first drug to be approved for this purpose. Over several decades of use it has proved itself effective on millions of men and women at reversing hair loss which resulted from pattern baldness. Rogaine have been available since the 1990s and treatment is surprisingly affordable, meaning that no matter what your financial circumstances there is no reason to simply accept pattern baldness as a fact of life. While pattern baldness is mainly associated with men, the condition also affects million of women worldwide. Minoxidil was originally approved for use only by men in 1988 after hair growth was discovered to be a side effects in its use as a hypertension medication in both men and women. Four years later, after much pressure from women and their doctors, the product was approved for use by women too. While the marketing differed in over the counter 2% minoxidil formula, the products are chemically identical. Initially all versions of minoxidil formula used 2% active ingredient. In 1996 an extra strength version of minoxidil, with 5% active ingredient, became available for men. 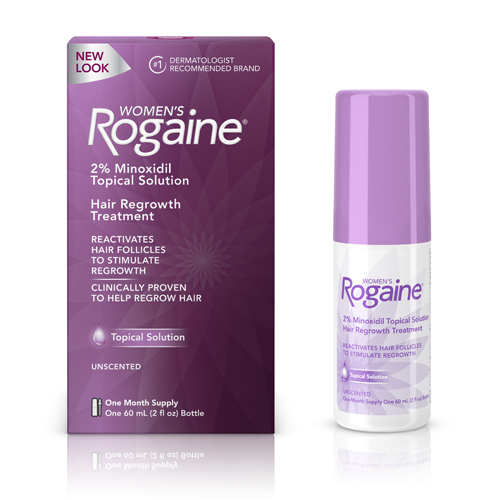 This extra strength product was not approved for marketing to women, however by the time it was released minoxidil no longer required a prescription and was available over the counter. Use of the 5% product by women is not illegal, but marketing the product as appropriate for women is. The reason why Extra Strength 5% minoxidil is only available for men is due to evidence that minoxidil is more effective for women than men. Both products have been shown to be equally effective at preventing further hair loss, however the extra strength formula leads to more hair growth. Side effects of minoxidil are also more noticeable in women, including lowered blood pressure and lightheadedness, and therefore a lower strength formula is safer. As minoxidil can lead to hair growth outside the intended regions, including facial hair, use of the higher strength formula by women is not advised. This extra growth typically results from run-off of the formula from the scalp onto other areas of the face, but evidence suggests that the 5% formula is more effective at stimulating the growth of facial hair than the 2% formula. It is therefore strongly advised that women use only the 2% product. Men may also use the 2% product, and this percentage has proved to be highly effective for men and was the only product available for eight years. For men the choice between the two formulas comes down to their preference in how thick they want their hair to be. Recommend apply on topical/frontline head (For Hair Regrowth) or eyebrows twice(2 time) in a day after shower,per time usage is 1 ml, dropper 1 time equally 1 ml & sprinkler head 3 time equally 1 ml and slowly massage 5 minutes.